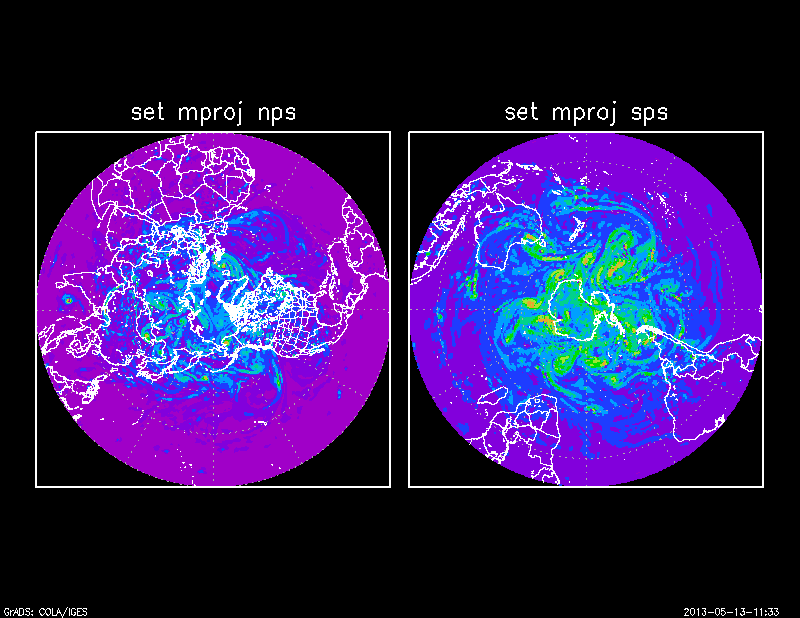 So, now that we have that out of the way, lets look at the other map projections. The scaled map projection does not differ much from the default cylindrical projection, except that it gets rid of the aspect ratio. Basically, using this option will squish, or elongate the map to fit your specified page area. The image below shows the transition. 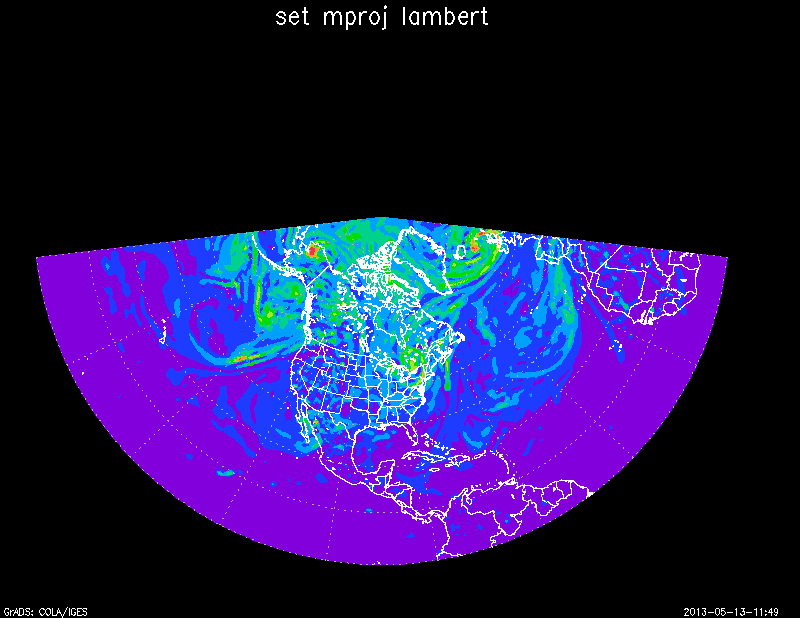 To show the different more dramatically, I set the lat/lon coordinates to -40 to 40 instead of -90 to 90. Personally, I don't have much use for the "scaled" map projection, but it is always an option if you need to fit stuff together. The NPS map projection can be useful if you are looking down at the north pole. Pretend basically that you have the northern hemisphere, and you flatten it. This would be the north polar stereographic projection. For the southern hemisphere, simply take the same concept and apply it. Now, while this map projection does not set latitude boundaries, my rule of thumb has been to set the minimum(maximum, depending on your hemisphere) latitude to be the equator. I have trouble getting information if I look at southern hemisphere values using an nps projection. 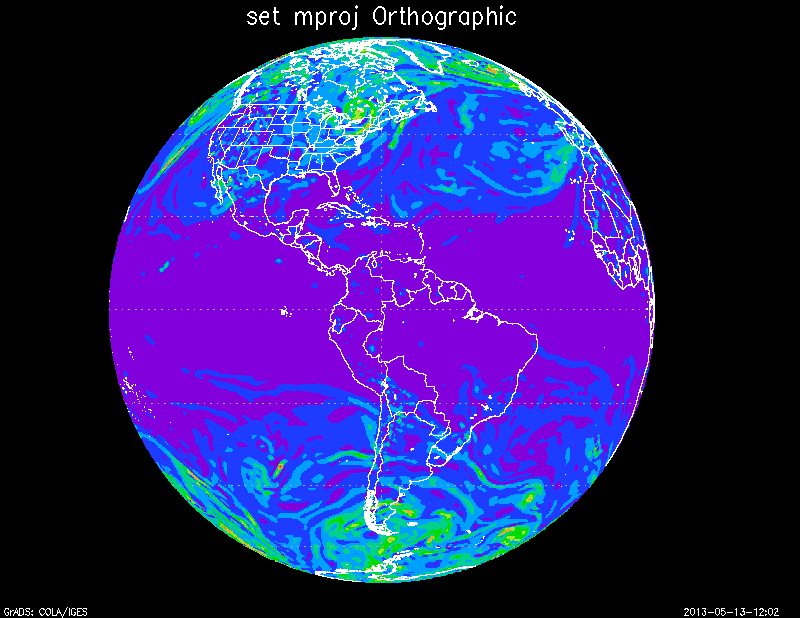 The example below shows each full hemisphere using each projection. Latitude set from 0 to 90 and -90 to 0. Now, you don't need to have longitude set to cover the entire globe either, or the entire hemisphere. 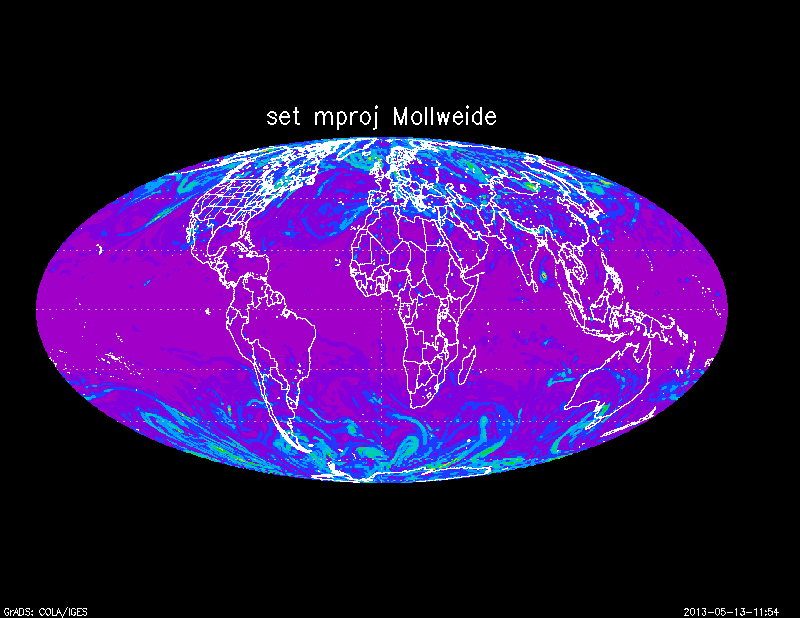 The Mollweide projection is often used to show global maps, but in GrADS there are no specific requirements for the latitude/longitude boundaries. This projection can be neat, as it sort or combines a spherical look with a cylindrical look, with the meridians converging at the pole. This gives a neat almost 3D appearance. The orthographic projection is another neat projection that gives a 3D spherical appearance. In GrADS there are strict requirements for the orthographic projection. Your latitude boundaries must span -90 to 90. Additionally, your longitude coordinates must span 180 degrees, no more, no less. You have the option of choosing your longitude boundaries, so long as they cover 180 degrees of territory. The result is an image similar to this one. 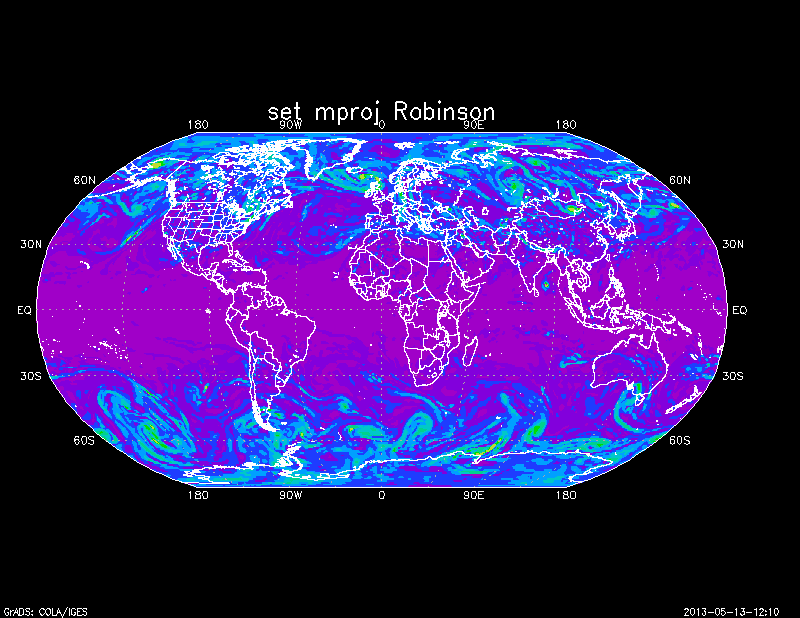 The last map projection I am going to discuss is the "Robinson" Projection (The "off" projection is not really interesting, so I'm not going to talk about it) The Robinson projection is similar to the Mollweide projection, but with the poles kind of flattened out. This is another commonly used map projection. In GrADS this projection requires that lat/lon boundaries cover the entire globe. Lat=-90 to 90, and Lon=-180 to 180 (0 to 360). 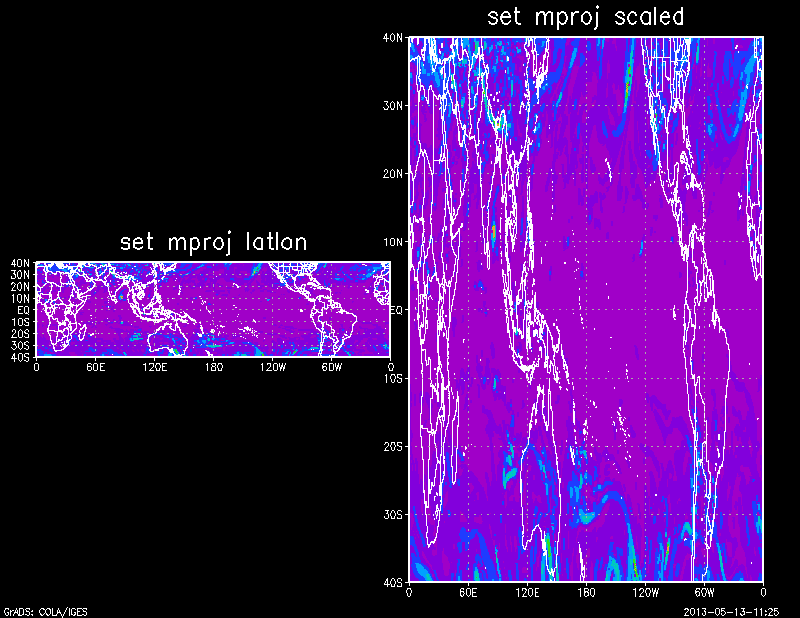 So that's it for the different map projections in GrADS. 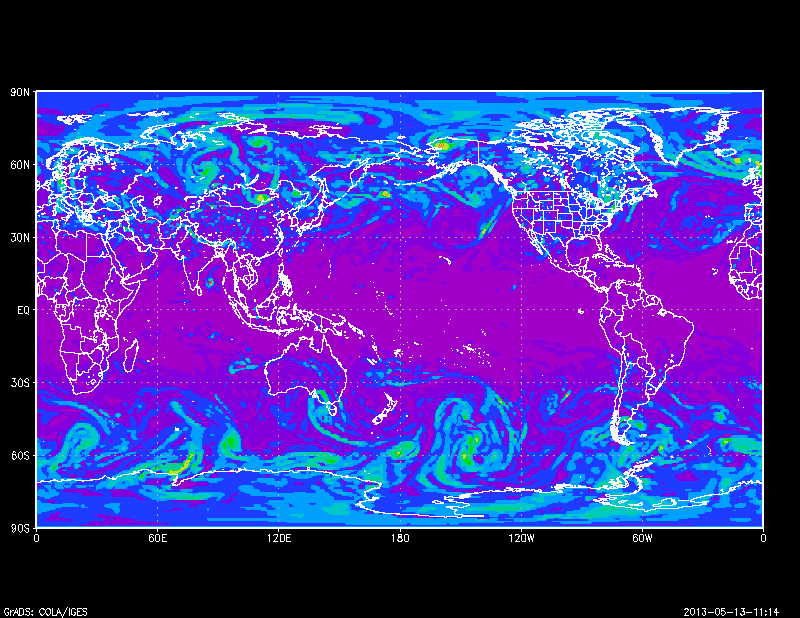 As always, each projection is useful depending on the situation, the map, the variable plotted, etc., etc. I hope this post has given you a little more information regarding each different type of projection. Just remember that some of them require specific lat/lon boundaries. Aside from that, picking the right projection is just a matter of trial and error. Thanks a lot man you are doing a great job by writing this GRADS blog. Keep it up.